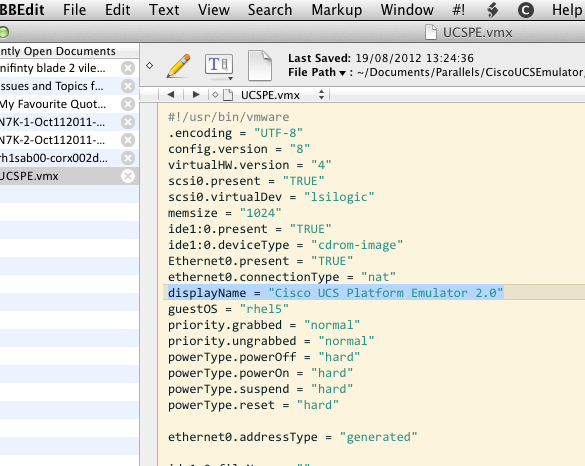 Downloaded the latest Cisco UCS emulator 2.0 for my Mac today but, as you can see, it is VMware format. My preferred desktop emulator is Parallels because I feel it works faster and better. It’s certainly more MAC-ish than VMware Desktop 3. No problem, I say. Parallels Desktop can convert those files and I’ll be running in a jiffy. Sigh. Parallels Desktop doesn’t like the brackets in the system name. 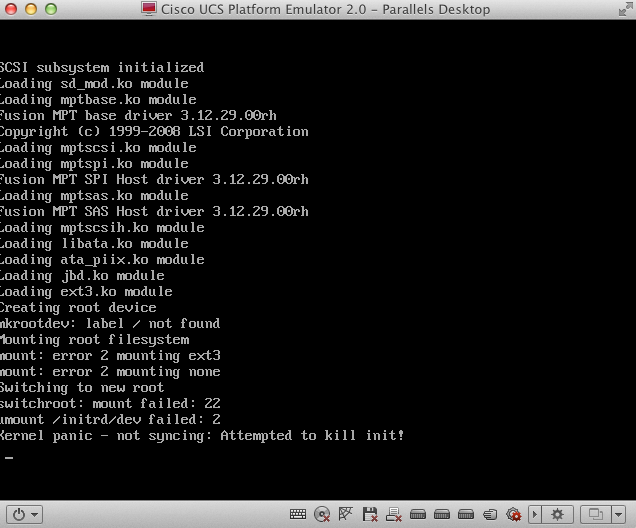 I’m hoping that someone from Cisco sees this and can help solve this problem. People really should stick to 7-bit ASCII text when naming files. It causes problems like this all the time. PS: I’d log a TAC case but I my CCO ID is not linked to a current service contract so I have no way of logging problems with Cisco. I work for several major institutions but getting a CCO ID added to a service contract is so difficult. This process involves so much paperwork and time wastage that it’s restricted to just a few operational people. Thomas Christory pointed out that I could edit the files manually. I didn’t think of doing this and so I edited the displayName like so. This lets Parallels open and convert the VMware image. So, I’m getting a bit hopeful. However, looks like the Linux hardware transfer hasn’t been successful. This looks something like a problem mounting drives that I can’t be bothered looking into right now. I not much interested in dicking around with Linux these days – too much effort for too little reward. Quote : I’m hoping that someone from Cisco sees this and can help solve this problem. Similar to IOU, I am pretty sure UCS manager emulator is supposed to be internal only…! Just download the VMWARE trial for Fusion and rename it yourself within the file and the use Parallels. he can edit the files manually… ! I guess you can then use vmware player for that specific vm, it’s free.